There is a farm on the edge of Burlington which used to be famous for strawberries. Over the years they have transformed themselves into a more full-season operation - plants in the spring, strawberries, raspberries, veggies all summer, and now pumpkins in the fall. I was at the farm last weekend (without my camera) to buy some pumpkins. I popped back up today WITH my camera to grab some shots. We had some good news yesterday. Paul, who has been out of work since Target created the biggest retail fiasco in Canadian history and tossed tens of thousands of workers on the street, was hired on the spot for a new job. I think he was in shock when he called me - going months without a job can be hard on the self confidence. I asked him what he wanted to do to celebrate and he promptly replied 'go to the new restaurant for dinner'. Test kitchen has an interesting concept - the regular menu features a core of regular menu items as well as 6 or 7 items that they are 'testing' for a 3 - 4 week period to gauge the popularity of them. They use ipad mini as the menu. They must have about 50+ Ipads at the front counter. It's a good concept because every item has a photo that you can click on to see what the dish looks like. A good picture can sell when words don't do justice . . .
Paul ordered the scallop tempura and he loved it. I passed on an appetizer which was a struggle for me, let me tell you. His dish was beautifully presented. For my meal I ordered the pork loin. It was wrapped in nappa cabbage and served with forbidden rice, an apple, pear, daikon radish slaw, and pickled cherry sauce. MMMMMM Great combinations and flavours here. Paul had the seared duck breast (apologies for the crap pic to come). It was served with a spiced honey sauce, green beans, crushed hazelnuts, and grilled king oyster mushrooms. What a great restaurant. We have all sorts of roadhouse type restaurants and chains near us but not many restaurants which are on the up-scale side and featuring fresh, inventive food. Test Kitchen is a welcome addition to the neighbourhood. 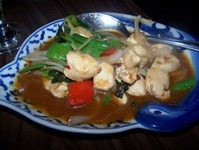 Don't expect to leave here full if you're tasting the Lunch or Dinner Test Menu- the portions are gourmet modest. What would you expect for 10 or 20 bucks (including that drink LOL)? The restaurant is small, and gets busy, so I'd recommend a reservation, especially on the weekend. One of the iconic images of a summer in Tuscany is a field of sunflower fields . . . this is as close to Tuscany as we are getting this summer . . . The field is only about 5 minutes from home so it isn't really traveling but sometimes the fleeting illusion is all it takes . . .
Paul and I returned home from our long weekend camping adventure on Monday. It was raining a bit when we pulled into the driveway but happily it stopped long enough for us to unload the car. Then the rain started . . . I called my mother, who lives 10 km away, to let her know we had arrived home in one piece. She complained about how dry it had been and wished she would get some rain. The rain that hit Burlington was localized and HARD. In fact, the city received somewhere between 125 mm to 200 mm in a few hours. Friends of ours had a foot of sewage fill their basement. We were lucky. We live in a new housing development. New housing developments now have to be designed with storm drainage designed to bring water away from houses, into a network of diversion ditches, sewers, and ponds. I often whine about the ditch and culvert in the back of our yard since it takes up a lot of space and messes up the landscaping. At one point during the rain it was full of about 3 feet of water pouring non-stop down the culvert and rushing to the holding ponds. It did its job and the basement was dry as a bone. More about that foul storm I mentioned yesterday . . .
We were predicted to get 15 cm of snow. Because we are near the shore of Lake Ontario and the water is warmer than the surrounding air mass, the storm system picked up extra moisture from the lake. Said moisture promptly froze and fell as more snow! By the time the storm headed east we had 30 cm of fluffy white stuff on the ground. This required three bouts of shovelling, followed by a fourth after the plow had plowed us in! By mid-afternoon I was sore and cranky. We are not used to this much snow in December. We live in a sub-division which was built as land was running out in the area - meaning large houses on small lots with no lawns . . . where does this snow go? Remember the joy of a snowfall when you were a child? Remember? Shame that joy becomes work and sore muscles as an adult. This week's Photo Hunt theme is 'fluffy'. Both of these pictures were taken a year ago . . . There is NONE of this fluffy snow on the ground a year later. When Paul and I got back home from our hike in the snow this fluffy guy was sound asleep on the fluffy blanket - you'd think he had been out in the snow all afternoon! No Sandra - not a walk in the snow, although we'd love it if Harper did that! Yesterday was a brutal, bear of a day. I had three meetings to attend, all at the same time and I was chairing one. I had a group of teachers in the office working on an activity and I had to supervise them. There was a budget crisis. Someone wanted to do an internship working on a project I'm ion charge of . . . it went on and on. It was so bad that when I went to the gym in the morning I tried to sequence what I had to do in my head. I couldn't - all the thoughts, the 'noise', kept getting all jumbled together. However, I managed to hold it together . . .
After dinner we went for a walk to get exercise and de-stress. I decided to bring my camera and this is what we saw . . . The wild flowers were in bloom . . . The trillium is Ontario's Official Flower. They are a lovely, pure-white flower. Sometimes nature throws a trick our way and the petals are splashed with green . . .
. . . or even pink . . .
Paul had fun walking on logs to make it through patches of mud. He was jealous of that fact that I have a freakishly good sense of balance and hopped along the logs. We steered clear of this big goose guarding the pond. Last weekend was a busy one for me. I was working a conference in Kingston on Friday and Saturday. I raced home Saturday because we had plans to go out with a friend for dinner. Paul wanted to try a new Indian restaurant in Burlington that had been opened for a few months - we had driven by but not popped in. It was time to correct this. Who were we to refuse? We sipped a Tahitian Sunrise while we opened gifts, chatted, and laughed. Then it was off to the restaurant. Bombay's Chutney, featuring high ceilings and big windows, makes the transition from the busy decorating in many Indian food establishments to understated without a drop in quality of the fare. It's located in the Longo's plaza at Walker's Line and Dundas Street and features a mix of muted colours and stylish lighting. The Indian touches show up in the profile of a room divider and art under glass on table tops. The menu is quite extensive and we had a difficult time deciding what to order. 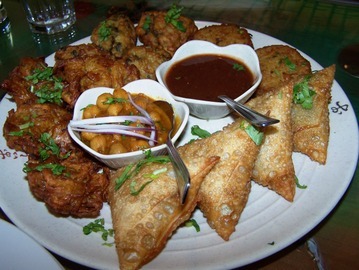 We decided to start off with an appetizer platter which featured a generous assortment of Vegetable Samosas, Aloo Tiki and Onion Bhaji. This was served with a tangy tamarind chutney and curred chickpeas. We decided to order a number of different dishes and share, that way we could try many different things. The first one to arrive was Lamb Tikka. 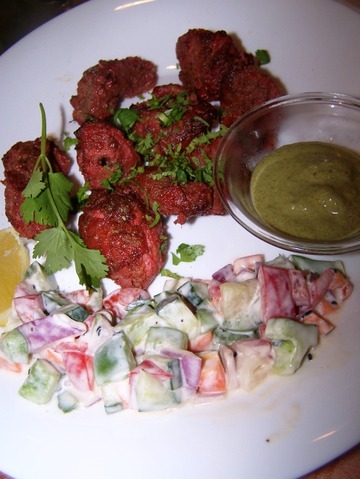 We enjoyed the juicy chunks of lamb which had been marinaded, cooked in a tandoor and finished with cinnamon. It was served with mint chutney and salad. 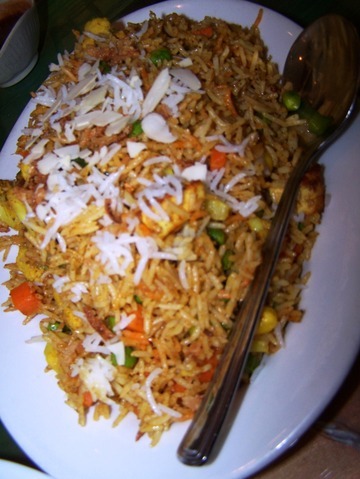 The next dish in our feast was vegetable biryani. This was an aromatic blend of ling grained rice cooked with saffron, vegetables and spices. 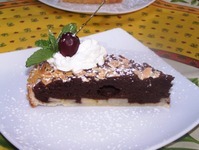 It came topped with crisp onions and sliced almonds. I really enjoyed the layers of flavours and textures in this dish. 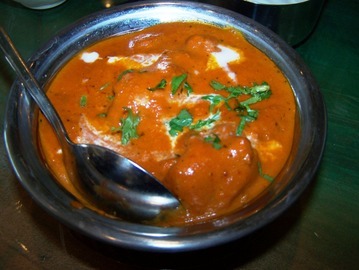 One of our all-time favourite things to order at Indian restaurants is butter chicken. I laugh at folks who think that the dish is actually made with butter; instead what we received was moist pieces of chicken cooked to perfection in a rich sauce of tomato, cream and spices. 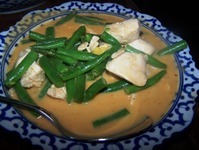 The sauce was accented nicely with dried fenugreek. Elise selected a vegetarian dish I had never heard of, let alone tried, for her dish. 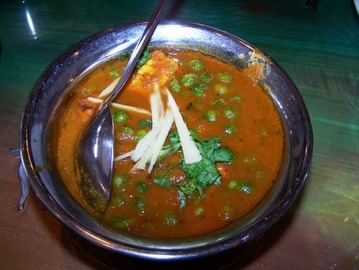 It was called mutter paneer. For those of you who, like me, don't have a clue about this it is cubes of cottage cheese that are simmered in a rich tomato sauce with cream, onions, and green peas. I was so glad that she had ordered this, I doubt that I ever would have, yet it was wonderful! Thank you Elise for expanding our horizons. Now, before anyone says anything, of course we ordered naan bread. I can not eat Indian food without copious quantities of hot naan bread to sop it all up. The waitress tried to tell us that we had ordered too much naan - clearly she hadn't met us before. We went with what our gut told us and were happy that we had. 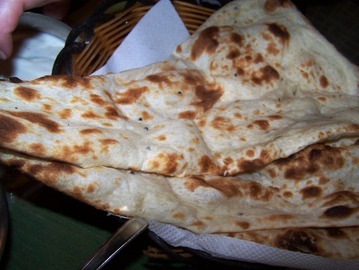 This was wonderful naan - light and crispy on the edges. Of course we were not able to eat all of this food so Paul had leftovers during the week - a good thing as I was away for four days running another conference. The portions were generous, the flavour incredible - there wasn't one bad dish amongst those we ordered. I can't believe that we have driven by this spot for seven months and not stopped in! We will definitely return. The dishes shown above, with steamed basmati rice, beers, and water came to $ 95 with the tip. Last week our friend Catherine suggested that we go to a 'Tuscan Thursday' event tonight. The Grinning Gourmand, a gourmet food shop here in Burlington that generally sells gourmet foods and light lunches, has recently started opening up on Thursday evenings for this special event. The shop is run by a personable young couple: Paul is the chef and his wife Cary does much of the greeting/serving. Dinner is served outside on a lovely patio nestled between the shop and the building next door. The wall of the shop is covered with ivy so it made for a very peaceful and relaxed setting - it actually reminded me of one of the restaurants where we had dinner in Rome (although without the extremely insistent rose seller but that, as they say, is a tale for another day). 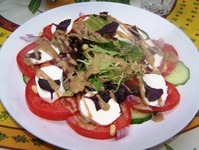 The menu is simple: three salad choices, an antipasto platter, two pasta dishes, two meat dishes, and two desserts. There was a limited wine and cocktail list. 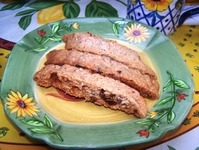 I discovered thaat the food wasn't traditional Tuscan food (having been to Tuscany last year I am of course an expert! 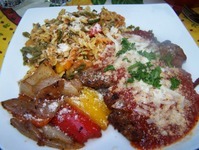 ), it was more a fusion of Italian regional tastes with a North American twist. It was, however, extremely tasty, freshly prepared, and served in an efficient and friendly manner. We started off with cocktails (I had a limoncello with soda which was an amazing drink for a summer's evening!). For our appetizers we ordered salads (a caprese for me). The caprese was unusual in that it wasn't made with roma tomatoes and it had a dressing instead of the usual simple olive oil, salt, and pepper dressing. It also had thin slices of cucumbers and baby leaf lettuce. However where it lost points on the 'traditionality' scale it gained because it was so fresh and flavourful; one of the servers actually gathered the basil for the salad from a tiny herb garden beside our table after we had ordered. 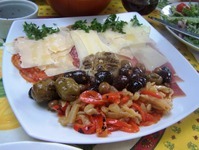 The antipasto platter was brilliant! It had three types of cured meats, three cheeses, roasted garlic, a wide variety of house cured olives, and roasted red pepper and eggplant. This thing was HUGE! I could have happily had this for my meal. For the main courses Ruth and Catherine both ordered a pasta dish which came with roasted vegetables, grilled chicken, in a tomato and herb sauce. It smelled wonderful. Paul and I both ordered Chicken Saltimbucca which was nothing like the saltimbucca in Rome (which as you know is the Saltimbucca capital of Italy!) It was really a chicken cutlet with fresh sage and prosciutto, breaded and served with a tomato sauce and cheese. 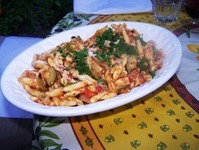 Like most North American Italian restaurants it was served with pasta, and a vegetable (roasted peppers, onions, and zucchini). OK, so it was not traditional in any way, but it was good! The portions were huge so I have lunch for tomorrow! The bill for the four of us was $ 224. This included four cocktails, a bottle of wine, a bottle of water, four salads, the antipasto platter, four mains, two tartes (Ruth and Catherine shared) and my biscotti platter. It was a nice evening; great food, better company, and the house did not need a second mortgage to pay for it all! Today marks the 43rd year since dad dropped off mom at the hospital and went off to work. Not long later a little Jerry was born. I once used to think I had an issue about age and getting older. I really don't though. I am content with my age and the freedom it brings. Of course - I notice things like thinning hair, slowing metabolism, fumbling fingers when I try to do up the tiny buttons on my shirts but I weigh that with the good things (own a house, great job, family and friends whom I love, and so on) and guess what, it is all good! Last night Ruth made plans to go out for dinner with us to a Thai restaurant here in Burlington called My Thai (how cute is that?) by the Lake. Yes, it is located by the lake at the base of a large condo looking out over the water. 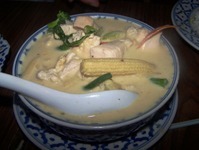 When I first moved to Burlington Thai restaurants were not to be found - they were far too exotic I guess. Now ten years later they thrive! We were supposed to be there at 7:30 and at twenty after seven Paul came upstairs and wondered if I was soon to be ready (I was finishing up yesterday's blog). I pushed save and ran about getting ready to go. Then I lost my wallet. Then I lost my glasses. Yes folk, we were late! Quite late it turned out. Luckily everyone else was late as well. 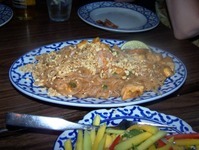 The restaurant is located in an area of Burlington that has many restaurants and bars but also has little parking. I was delayed again while we tried to park. Finally I dropped Paul off and drove around until I had a spot. There were six of us for dinner. Paul and I, Ruth, Dave, Rosanne, and Catherine. It was wonderful to see Dave and Rosanne because we so rarely get to see them (they live in Ottawa) and a surprise to see Catherine. Paul, Ruth, Catherine, and I all have birthday's with 16 days of one another so this was really our 'birthday dinner'. It was a shame we didn't know Catherine was coming because we would have brought her gift with us - oh well, she will get it on Monday when we go to our class at the LCBO. The restaurant was full - I had never been there when it was this busy. There were a number of large tables; it seems as if many people were celebrating birthdays! The waitress seemed a bit harried when she came over and took our drink orders. Ruth, ever the planner, also ordered our appetizers (2 orders of shrimp rolls, 2 orders of spring rolls, and 2 orders of soft spring rolls). Our drinks arrived followed shortly by our appetizers. We were so hungry that I didn't even have time to snap some pics before the plates were emptied. 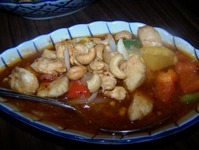 For our main dishes we ordered 'family style'. Everyone ordered their favourite dish and we all shared. 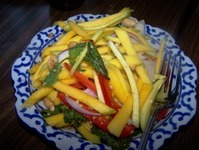 We ordered 2 mango salads, 2 cashew chicken, 2 basil chicken, Pad Thai, Red Curry Chicken, Pineapple Chicken, and Emerald Curry. Every one of the dishes was chicken (poor planning on our parts)! The waitress reminded us that we hadn't ordered rice and she suggested two large dishes of jasmine rice which was perfect. The bill for the six of us with beer, drinks, and non alcoholic drinks for the non-indulgent types, was $ 180. It is rare to get a great meal such as this for $ 30 a person. Clearly we shall return, just not on a Friday night when you can hardly hear yourself talk to the person next to you. After dinner Ruth invited us back to her house for drinks, coffee, tea, and cake. We knocked back a wonderful red wine from Australia that Ruth had in her wine cellar (good choice Dave)! and enjoyed cake supplied by Dave and Rosanne. At 11:30 we had to dash home because I was getting quite tired. Our plan was to go to the market today and if we were going to leave at 6:30 to beat the summer 'tourist' rush we could not have a late night! Tonight Paul is cooking my birthday dinner and then it shall be more gifts. Yeah. It all makes getting another year older soooooo very worthwhile!